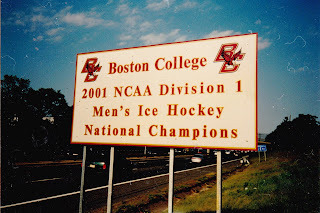 If you spend a lot of time on the stretch of I-90 between the Brighton and Weston tolls (like I do every single day), you'll notice that the signs coming up to the Newton exit that signify BC's hockey dominance still boasts the 2010 championship - my apologies for the header picture that shows the 2001 sign, but it was what I could find. The new sign is still in construction, because it includes a "Days Since Last Hockey Championship" electronic countdown. There is only budget for one sign change every year, and with the best coach in the last 15 years behind football, it's best to wait until we just miss making the Military Bowl. The Mass Turnpike Authority shot down the idea of a life size statue of Jerry York looking dapper and rotating to follow the path of the sun so it always shines brightly on his face. They thought it was too "Turkmenbashi-esque"
Until it's up, Johnny Gaudreau just stands there holding a piece of paper over the "0" that says "2" - but since it's been too hot for him to wear skates, he can't reach. Honestly, I have no idea how long it should take to make the replacement sign. Anyone remember from 2010 or 2008?